One night, when Sophie got ready for a ‘bad taste’ party organized by the university, she went all out wearing a tie-dye synthetic blouse, sparkling bell-bottoms, multicolored eye-shadow and a bunch of crazy accessories. On her way out she realized, as bonkers as she looked, her hair could still use a little extra pimping. Immediately Sophie set her eye on the old telephone hanging on her dorm wall. It didn’t really have any use, since it had been out of order for years. So she decided to unplug the phone cord and use it to tie up her hair as an extra highlight for her already quite spectacular look. Next morning Sophie woke up after a night full of fun realizing that something was different. Then it dawned on her: She didn’t have a headache! After a quick moment of shock she realized she didn’t lose the phone cord, but it still firmly held her hair. After untying the cord she also realized that the mark in her hair, even though still visible, was a lot less strong than usual. That’s when she knew that she might have an idea on her hands! The idea of invisibobble® had been born, but Sophie needed someone to help her further the concept - her now business partner Felix. It took 6 months and the help of German technicians to design the very first invisibobble® with its correct material, form and size. In 2012, the first test-launch took place in Germany, and the small firm spent a total of 12 months gathering feedback from customers to continuously improve the invisibobble. 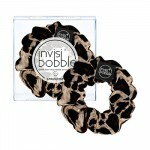 Now it was time to introduce invisibobble® to the international market. Ever since the international launch in 2013, the demand for invisibobbles has exploded. If you have any questions or would like more information about the invisibobble products we carry, please contact WCB Customer Service or your Sales Representative at WCB.